When I was a bairn and wanted to play Star Wars with my mates we never got very far. Everyone spent ages arguing over who was gonna be Han Solo. Luke was a nice lad and that but Han was cool. He flew a cool space ship and had a cool gun and snogged Princess Leia and stuff. Chewie was a bit of short straw too as all you got to do was growl and of course, if a girl deemed us fit to play with, she had to be Princess Leia. Now the argument would be widened as it wasn’t fair that just ‘cos she was a girl she had to be Leia. The riposte of when we played Buck Rogers she was always Wilma never held water either and it all descended in to chaos and Star Wars, or Buck Rogers for that matter, ended up being passed on and we wazzed off on our bikes to throw things at people’s windows or summat … any way I digress. Before I’ve even started, yes, I know … what if that unfortunate young lass in early 80s childhood world who didn’t want to be the cinnamon whirly haired daughter of Alderaan had a Solo-esque female role model that she could be? Well, now she has and there is in the shape of the scoundrel that masquerades under the guise of scruples-less archaeologist Doctor Aphra. After turning up and stealing the show, amongst other things, in a sort of rogue-ish “Indiana Jones meets Tank Girl in space” gun for hire manner before finding employment with Darth Vader is not quite all the fun and games she expected (who’d a thought it?) before getting the wrong side of a certain Alderaanian royal, Aphra now has her own comic book. The latest Marvel run of Star Wars that takes us back to the golden era of post Battle of Yavin/pre Battle of Hoth has been, I have to say, pretty marvellous so far as it concentrates on the classic line up and captures something of what hooked me all those years ago. Extending that universe to incorporate new folk that will hold their own against the heavyweights we have loved for forty years was never going to be easy (just ask Mr Lucas) but with Aphra I reckon this team have cracked it. Along with a ferocious Wookie, an astromech and protocol droid it’s not difficult to fathom out why this works so well. A twist on the simple formula and it’s a winner. The droids are like inverse versions of everyone’s favourite robotic comedy double act with bad attitude and violent, homicidal tendencies over riding their original programming. Like Bad Droids isn’t the movie you all want to see right? Origins already established to those of us keeping up, we are straight on to the action… Starting off in a pickle, Aphra is threatened by some shady character that she is apparently in debt to … again, is this looking familiar? She’s escaped Vader however, and isn’t afraid of anyone, in fact, sticky situations are simply the gateway to adventure to our new (anti) heroine and after a bit of family back story we are sat alongside Aphra and her rag team wazzing off in to space on the trail of a lost and powerful artefact that just might just get her off the hook for a number of previous indiscretions. If, of course, she survives … What follows, I have to say, is a rollicking good romp. Proper old fashioned Star Wars! AT AT Walkers and everything. 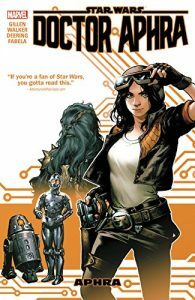 Aphra is a great new character and I’ll be looking for her action figure next time I hit the comic shop. 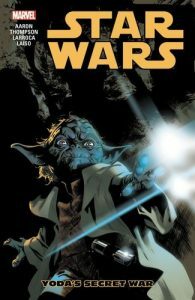 With the rejuvenated series up and running the main story takes a break for an excerpt from Obi Wan Kenobi’s journal in the fifth collected works book Yoda’s Secret War. A rather intriguing device this is. Done it before they have. Setting the action in the midst of the original trilogy, C3-PO has been captured by Imperial forces and is currently driving them all bonkers with his inane prattle. The initial opening scenes deal with the dilemma of whether it is worth a risky rebel rescue for “just a” droid? Plucky little 3-PO buddy R2 thinks so but the more flesh and blood members of the alliance vote no. As Skywalker whizzes off in his X-Wing he decides to leaf through another chapter of the journal he has taken to leafing through when the writers want a break from the main story … erm, I mean, to widen the narrative to unrelated new tales from new worlds with new characters. This one has a youthful Yoda running in to a war like tribe of Mad Max 3 like warrior bairns in a barren, rocky wasteland. A bright and colourful art style helps the storyline move along in a slick fashion that has all the right levels of mystic force capers and long lost legends and lore. The isolated planet that doesn’t appear on any maps or charts is home to a pair of primitive races locked in an eternal struggle and a secret that lies deep within one of the vast desert mountains that tower over the warring warriors. Yoda, with his calm and meditative manner is not welcomed by either group at first, but patience he has and to the bottom of the mystery he does get. His journey there is most enjoyable, if a little barmy by the end and it all comes full circle as modern day Skywalker investigates the forgotten outpost of civilisation that Yoda sorted out to find that well, no matter which side of the conflict you are on, there are no winners and the words “good” and “bad” are interchangeable terms.